By digitizing your video tapes, the ageing process gets halted. Especially old analogue material has the tendency to loose quality quickly, under the influence of magnetism; a lot of video material is saved on a magnetic carrier, like a videotape. We can digitize your old cine films professionally. We'll transfer your films to files which can be played on almost all modern TV's, tablets (iPad) and smartphones. We can also put your films on DVD or Blu-Ray. You can easily calculate the costs with our easy-to-use Price calculator. As a standard we'll be digitizing your video tape to a computer file to put onto a USB stick / hard disk. We'll be digitizing to whole video tape. You'll get a personal link for downloaden the files if we're making your files available via the internet. We'll store your files on our server for 2 months. After that period they will be removed. Another option is to transfer you video tapes onto DVD. 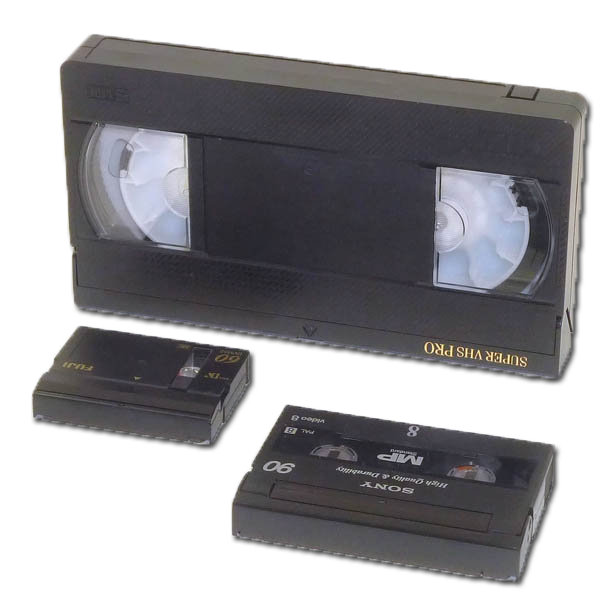 You can indicate in which order your want your tapes to be put on DVD and if you want more than one tape on a DVD or we can put your each of your tapes on a separate DVD. There is a maximum of 120 minutes of video on one DVD. We can convert your video recordings for all modern video formats. We deliver your digitized tapes in the format: H.264 by default. We can also deliver other formats if required, of course. For example, DV AVI Apple Prores 422 HQ or uncompressed AVI. If you want to work professionally with video you can consider other codecs. For more information see our codec page. After scanning we can edit the film for you. We can cut the film, change the order of fragments, put titles in the film, transitions, voice-overs and background music. You can specify how you want us to edit the film or we can edit it ourself to make a really good film. Of course you may also choose yourself if and which fragments should be cut out of the film. All prices include 21% VAT and are subjective to change. If you want to estimate the costs for digitizing yourself you can use our, easy-to-use, Price calculator. The price does not depend upon the amount of minutes of video that are on the tape. If, during our digitizing proces, we discover it's necessary to repair or to clean your tapes or if we find the tape has become self-adhesive and needs to be loosened up, we'll always ask for permission first. We're using well maintained professional equipment to digitize your video's. If the image quality of a tape is less than it should be we'll try this tape on a different machine (other brand and type) to rule out any problems with the equipment.